Singapore Merlion 5g 999 Fine Silver Bar - Limited Edition. This unique Singapore design, The Merlion (Malay: Singa-Laut) is a mythical creature with the head of a lion and the body of a fish, used as a mascot of Singapore. Its name combines "mer" meaning the sea and "lion". Every pieces of Singapore Merlion 5g 999 Fine Silver Bars guarantee its purity of 999 fineness of silver content. It comes with limited mintage of 5,000 pieces worldwide only. 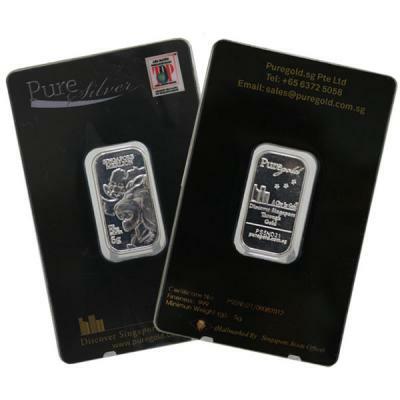 Singapore Merlion 5g 999 Fine Silver Bar minimum order requirement is 25 gram. Order now to secure your order with us.